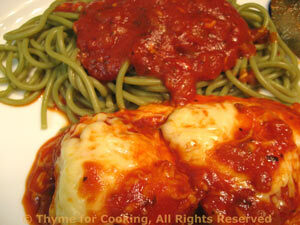 Chicken Parmesan with Pasta, Thyme for Cooking main course. You can substitute sliced chicken 'tenders' if you like, or thin turkey cutlets. Both will cook a little faster. The chicken is browned, then finishes cooking in the oven while the sauce cooks in the skillet, keeping the crust intact. Mix bread crumbs and Parmesan in a plastic food bag. Add chicken breasts and coat well. In medium nonstick skillet heat 1 tbs oil. Add chicken and brown well on both sides, 7 - 10 minutes, each. Remove, put on large, heat-proof plate and keep warm in a 250F (125C) oven. Add tomatoes, oregano, wine, vinegar, and sugar. Remove chicken from oven and put into pan with the sauce. Sprinkle chicken with shredded cheese and cover until cheese melts. Put the chicken back on the hot plate, spoon some sauce over and serve with the remaining sauce on the side for the pasta. The Parmesan is for sprinkling on the pasta.